Flicking through one of those airline mags recently, I was amused to discover that Geelong Grammar pop star Missy Higgins had named Spoonful, 543 High Street, Prahran, Tel +61 3 9521 5212, as one of her favorite Melbourne cafes. She must be an early riser (see my previous rant). This morning, we took Missy's advice and dropped by for some eggs. Third time lucky, we arrived (1) in time for brekky (11.45 am cut off) and (2) when the place was open (closed Sunday). I'm glad we did. 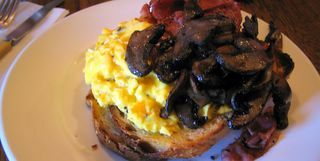 Not only were my scrambles very good, but the sourdough toast was the best I've had so far. Curiously, the bread came from the same place that Missy went to school, namely Geelong (La Madre Bakery, to be specific). They also served up some excellent sauteed mushrooms (dark, tasty and not wet), and a decent serve of "thin crisp" bacon (which was an original touch). Although there was no HP sauce, they did come through with some red onion chutney (at least, that's what it tasted like to me). In addition to the usual fruits, mueslis and stuff-on-toast (eg, Persian fetta and roasted tomato on olive toast), the "Autumn menu" included a choice of three omelettes: Tom Cooper's smoked salmon, fresh tomato & oregano, or mushroom & parmesan. The place itself has a good feel, with purple walls, cushioned banquette, and two spacious communal tables. The Genovese coffee is excellent (and arrives quickly), and the service friendly and efficient. We were there on the weekend, so the crowd was a mix of young(ish) and old. But I'm guessing it fills up with ladies-who-lunch during the week. Botox latte anyone? The Cunard Line very modestly describes the Queen Mary 2 as "the world's largest, longest, tallest, grandest ocean liner ever". Sounds great, but how good is the breakfast? Well, according to Norman (former member of a secret society known as the Gourmet Bastards), the Eggs Benedict were pretty good, but probably not the "world's greatest". Then again, with 1,300 mouths to feed, you need to cut them a little slack. The weak link was the muffins, which were under-toasted, chewy and hard to cut (an all-too-familar story). 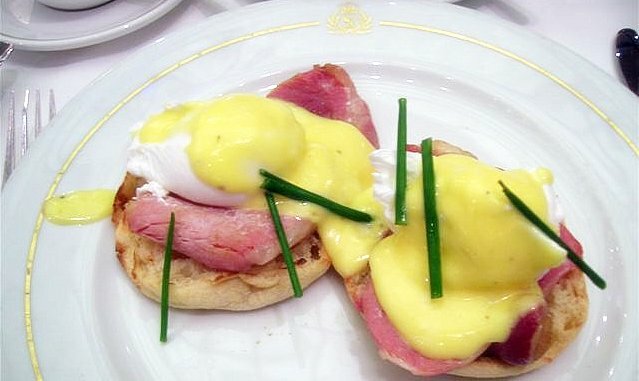 Apart from that, no major complaints... well poached eggs (good shape, whites cooked, yolks runny), high quality hollandaise, a choice of English or Canadian bacon (very lightly grilled), and a few decorative strands of fresh chives. This particular dish was enjoyed in the Brittania restaurant, a cavernous, multi-story dining room, where the service was "silver" and the atmosphere grand. Which makes me wonder, where does one go for "gold" service? I'm starting to think the gods are conspiring to keep me and the Replete Providore corn fritters apart. First, I get a flat tyre on the way there. Then, our advance party reports back with bad news: we're facing at least a half hour wait for a table of six. So, invoking Plan B, I park my deflated scooter and hoof it round the corner to Saragossa, 369 Bridge Rd, Richmond, Tel +61 3 9429 7880. Quite appropriate really. Breakfast turned out to be very pedestrian affair. My scrambled eggs weren't bad, they were just average (not at all creamy). The home-made baked beans weren't bad either, but you wouldn't call them good (neither thick nor rich). And although the bacon and toast were OK, I found both a little dry and disappointing. The same was true for my fellow brunchers. Poached eggs OK, but a tad overdone and tasting of vinegar. Corn-flake crusted french toast looked good at first, but was dry and disappointing when you got stuck in. Saragossa is spacious and fairly stylish as a venue, and the staff are pretty good. At about $15 a head it's not bad value, but not IMHO worthy of a repeat visit. In fact, "not bad" is about the best way I can think to sum the place up. It's an impressive looking dish, hotcakes stacked high and swimming in a bright berry jus. Tastes good too, especially when you blend the powerful lemon curd with the more subtle flavours of the berry-soaked hotcakes. The hotcakes themselves were thick, light and very hard to fault. But I reckon the Bill's version was fatter, fluffier and probably better by a whisker (talk about splitting hairs). As much as I hate to admit it, I think Degraves Espresso, Degraves Street, Melbourne, Tel +61 3 9654 1245, is past its prime. It still sets the standard for grungy lane-way cool, but the scrambled eggs are no longer the best brekky contender I used to think they were. Which is not to say that my scrambles were bad. It was a very large serve of well-scrambled eggs with no wetness or separation to spoil the show. But it lacked the light, creamy edge of somewhere like Bills, and it wasn't quite as buttery as I remember from previous visits. Indeed, thinking about the generous sides of bacon and mushrooms (both good but not great), it's hard to avoid the conclusion that quantity trumps quality in the current Degraves kitchen. With its cramped collection of fold-down theatre chairs and wonky desks, securing a good spot is always a challenge. My favorite is the window bar, which lets you ponder the morning papers or perve on the passing foot traffic, as you prefer. Degraves has a crew of designer-scruffy staff whose service is friendly and efficient most of the time. They do, however, have a tendency to forget the odd detail, which can be frustrating. The coffee, however, is consistently very good. After a visit to European, 161 Spring Street, Melbourne, Tel +61 3 9654 0811, even the tossers at Gourmet Traveller Restaurant Guide could see they were in trouble. How to reconcile such magnificent food with moronic review rule #3: "A breakfast menu is often the sign of a compromised restaurant". Get rid of the rule, perhaps? No... with all the credibility of Jessica Simpson commenting on a G8 summit, they blurt it out anyway, then cobble together some feeble exception. People like that don't deserve such fine Eggs Benedict. The best I've ever had. It wasn't quite perfect, but it came close. The poached eggs were flawless... with deep, dark-yellow, soft-centred yolks (free range of course). The hollandaise was excellent. The muffins were fresh and toasty. And the thin-sliced ham had been grilled just right. The only thing missing was the potato, which, as I've explained before, is very much an optional extra when dining down under. Other highlights of the menu include scrambled eggs, goats cheese and asparagas on sour dough; huevos madrilenos (baked eggs with black pudding and chorizo); Croque Monsieur (with a gruyere bechamel); and corn cakes with chutney, avocado and sour cream. Or, for a bit more fibre, try the toasted or bircher muesli with stewed apples and rasberries. To round out the breakfast experience, European has excellent staff, serving very good coffee in a welcoming, wood-panelled environment. Just the place for a breakfast meeting if you happen to be up the Paris end of town... even if it is a tad expensive ($15.50 for my eggs).